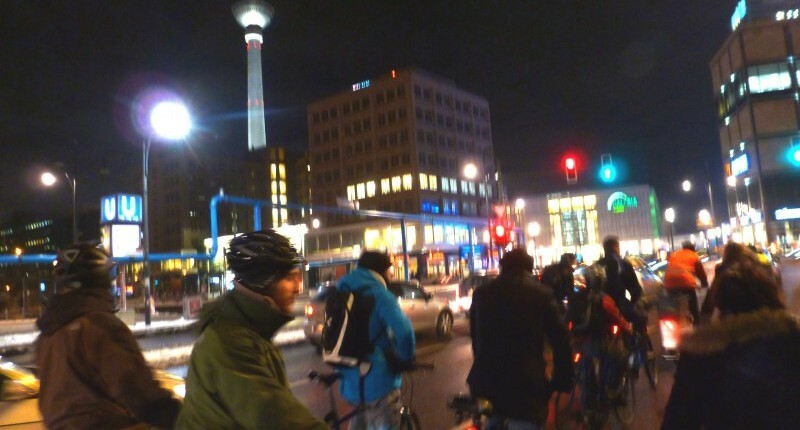 At the beginning of this year I had the pleasure to visit Berlin for half a year for my master thesis research on bicycle activism. 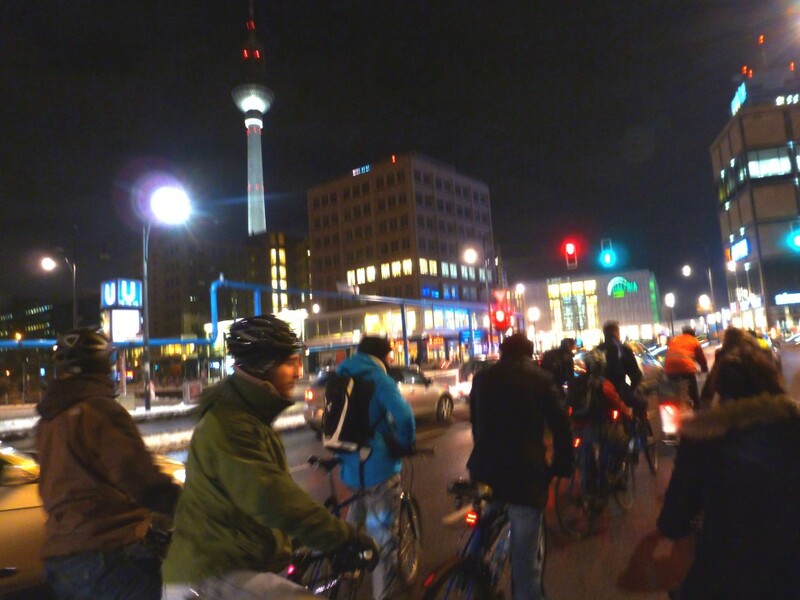 As in many cities in which the bicycle is an endangered species, activist groups advocate for the bicycle and its implementation in the municipal policies of Berlin. While the bicycle is a much used means of transport in Berlin, the bicycle as a modality is not facilitated well. Bicycle infrastructure is confusing and rules are counterproductive rather than improving bicycle safety. Advocating the improvement of the bicycle, in policy and civil acceptance, are various activist groups, of which the most to the mind speaking must be the Critical Mass; a bicycle advocacy group inspired by the movement which started in the early 1990s in Los Angeles, and which is present in many cities where the bicycle is endangered. During this period I cycled through the city myself, as a true Dutchman on a bicycle with a back pedal break. Soon I noticed that nobody uses back pedal break bikes in Berlin. This is because of national bicycle regulations to have at least two working breaks. Besides this, there are many other rules which left me confused. For example: one may not move a person on the luggage rack, a common practice in my home country. And one needs to have an attached light powered by a dynamo (so no battery lights allowed). Battery powered lighting has been allowed since July 2013 as regulations on bicycle lightning changed. As the city of Berlin is known for its tolerant and progressive attitude, you would expect the bicycle to be a modality embedded in policy and practice. Often, pictures of extravagant types riding the bicycle are shown when reporting on the typical Berlinner cyclist. Interestingly however, there seems to be a revolution taking place, mainly in the gentrified or gentrifying parts of the city. Here, a new urban generation is choosing the bicycle as their main means of transport. The typical Dutch ‘bakfiets’ is becoming a common sight in these parts of the city. The bicycle modal split underwent a boom in Berlin during the early 21st century, as it rose from a 6 % in 2004 to a 13 % early 2013. These numbers are for the entire city area and bicycle modal splits vary very strong when looking at the different city districts. Cycling in one of the -in theory- bike friendliest cities of Germany has two sides. On the one hand, you have the bicycle friendly neighbourhoods of Kreuzberg and Prenzlauer Berg, where a large part of the population uses the bicycle regularly. On the other hand, most of the city districts surrounding these central neigbourhoods are much less bicycle friendly. These neighbourhoods have much more dedicated bicycle infrastructure than the rest of the city. Even streets where the bicycle is the main user can be found here. Other parts of the city, such as Neukölln, where I was living myself, have much lower quality bicycle facilities. Cycle infrastructure is often missing, or it is of such low quality that it poses more of a danger (to either the cyclist himself or pedestrians) than it improves bicycle safety. Especially the so important subjective feeling of safety, which is normally provided by separated bicycle tracks, is often worse when cycling on a 30 cm bicycle strip on the side walk than when cycling in between the cars on the main road. The latter is a is an omnipresent discussion in the Northern Americas about bicycle infrastructure and is referred to as the vehicular cycling theory; the theory that being part of the traffic and cycling on the main road is much safer than cycling on dedicated cycling tracks (+ other advantages as less costs etc.). This discussion is also exists in Berlin, which is not surprising, looking at the many different sorts of bicycle infrastructure present in the city. 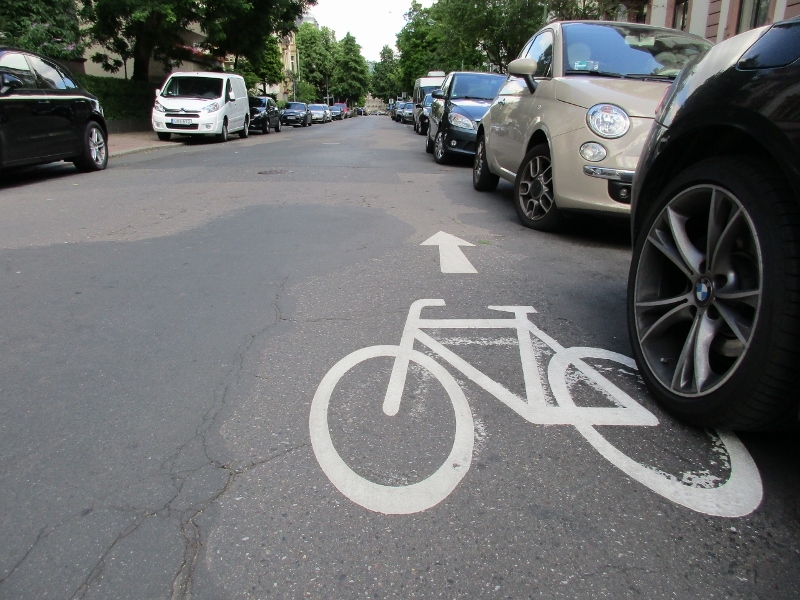 Besides an outdated bicycle track network built in the 1980s in Western-Berlin, other parts of the city have various types of bicycle infrastructure, such as the separated bicycle path which commonly disappears every 200 meters to show up several hundred meters further. This often results in dangerous situations as you have to manoeuvre your bicycle through parked cars on the end of the cycle path onto the road, where you often have to manoeuvre around double parked cars as well. Many of the Critical Mass cyclists support the vehicular cyclist approach; they feel oppressed as a modality and plead for the equal approach towards cars and bicycles. During the Critical Mass this was emphasized by the fact that the group cycled on the road, grouped together, blocking car traffic, but not obstructing them: the cars merely had to slow down. Some aggressive behaviour by angry car drivers could be expected. Some of them would race by to show their road dominance, while others waited patiently. 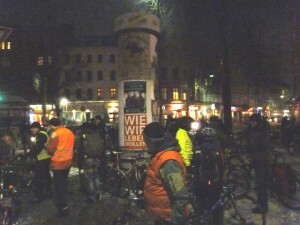 The Critical Mass group changed route regularly. No cars were obstructed for a long period. While the bicycle modal share is relatively high in Berlin (relative to worldwide and German averages), there still are many things that need to improve. Most obvious is the improvement and unification of bicycle infrastructure, which currently is confusing and often missing and results in dangerous situations on main roads and crossings. 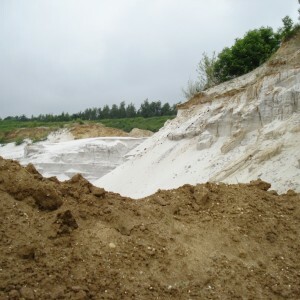 All in all, I would not consider bicycling in Berlin suicidal, but you have to keep an eye open for cars and for the bicycle path which can be either missing or situated as 30 cm strip on the road or on the side walk. Stephan, thanks for this article. 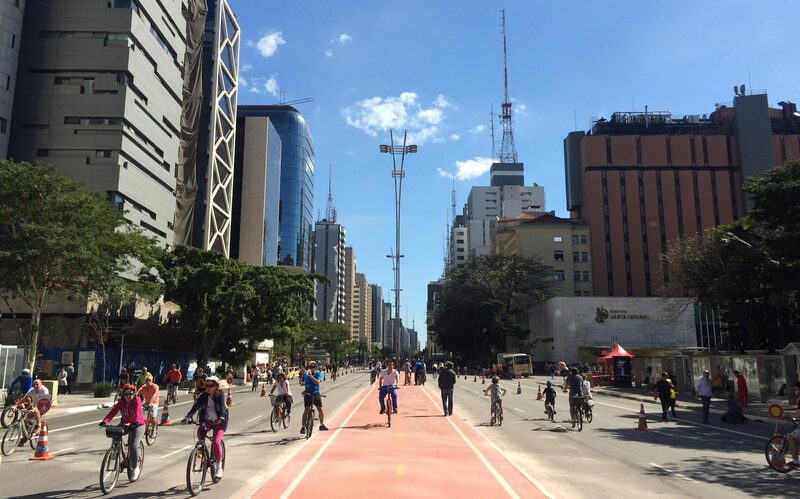 There seems to be an urgent need for dramatic improvements in bicycle infrastructure. Not only in Berlin or the other cities the Protocity wrote about, but everywhere in the world.